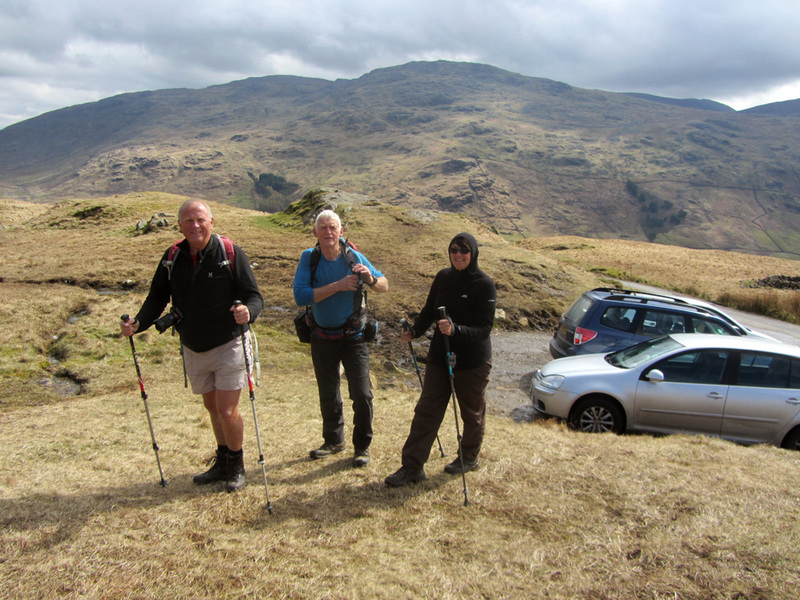 " Hardknott and the Eskdale Needle "
Date & start time: Thursday 14th April 2016, 10.30 am start. Walk details : 3.2 mls, 750 feet of ascent, 1300 feet of descent, 3 hour 30 mins. 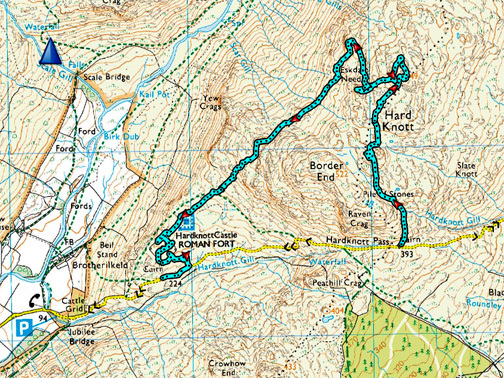 Walk two : 2.1 mls, 300 feet of ascent / descent, 1 hour 30 mins. 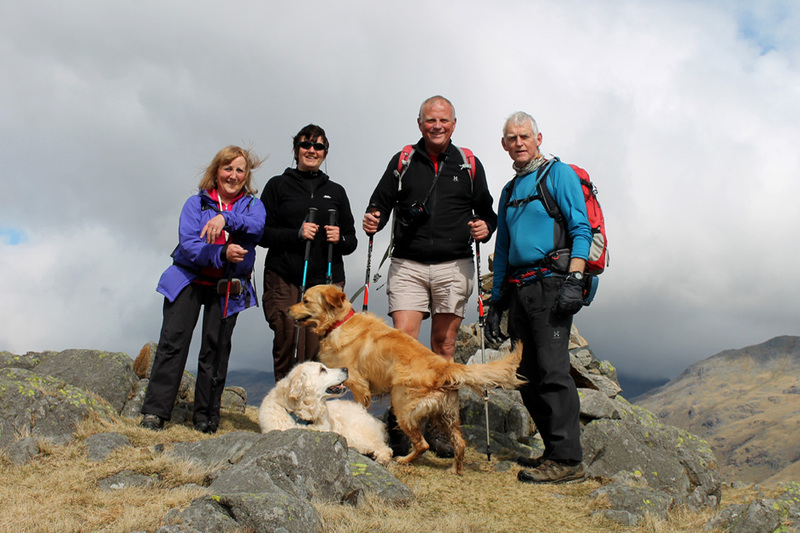 Highest point : Hard Knott Fell, 1784 ft - 549 m.
Walked with : Hilary and Richard, Ann and our dogs, Harry and Dylan. Weather : Overcast with good sun to start. We are with Richard and Hilary today, who have travelled over from their holiday caravan sited at Coniston. and ends up at Mediobogdvm, the Roman Fort. 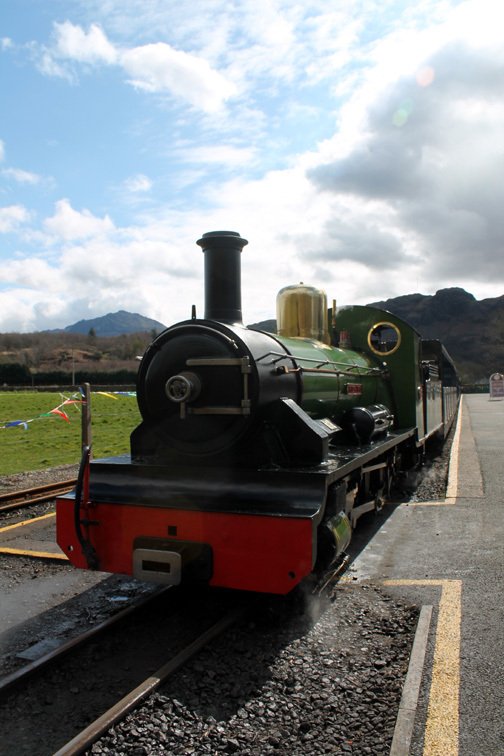 We meet at the railway station but have arrived from different directions by car. 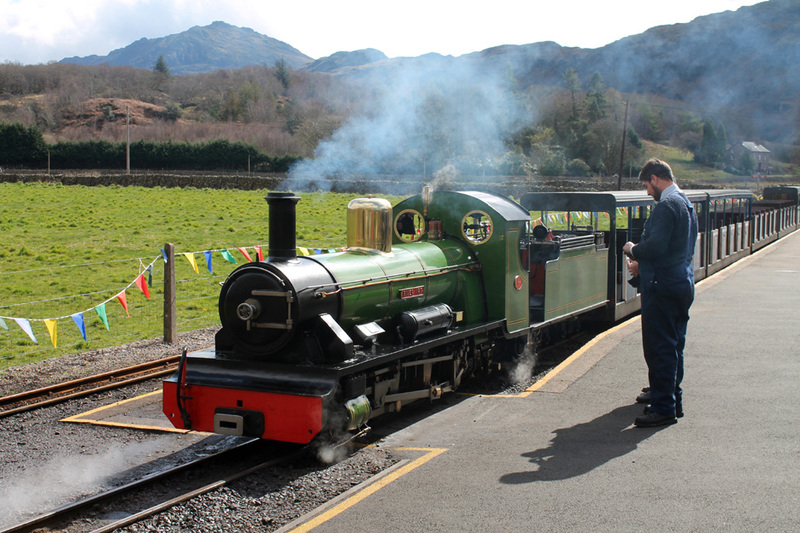 Still it doesn't stop you enjoying coffee and biscuits at the cafe and having a look around at the steam train that has just arrived from Ravenglass. 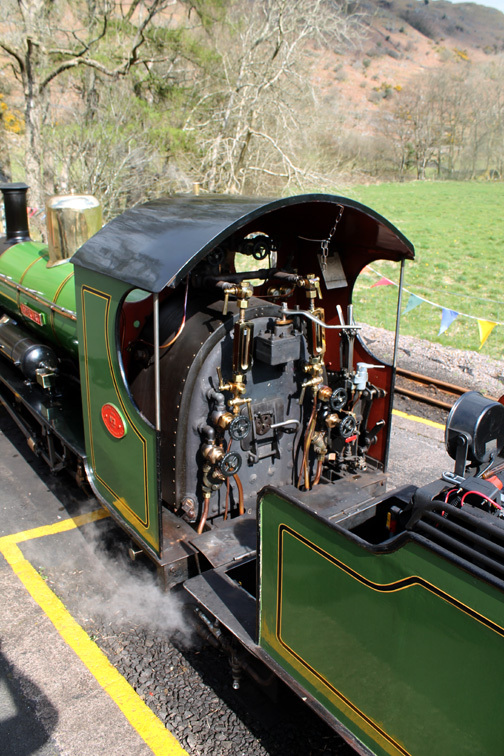 The River Irt loco at Dalegarth station . . .
. . . all turned round and ready for the return trip. 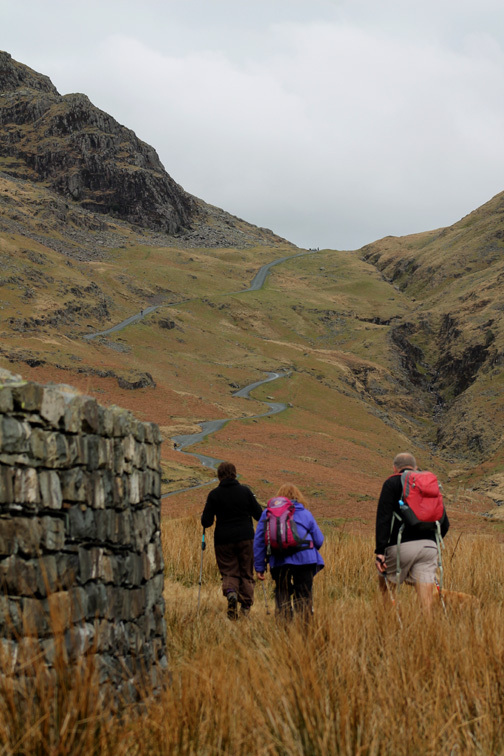 Our walk starts at the top of the pass . . . most easily climbed in the car ! 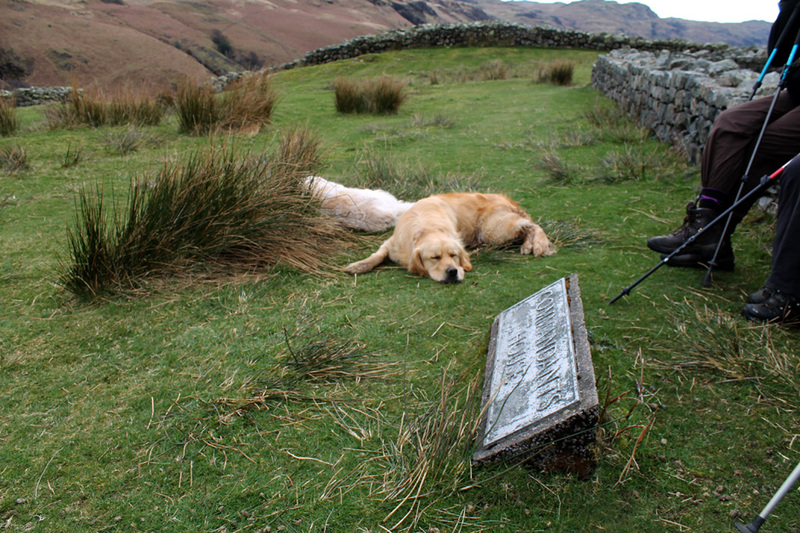 Our companions today . . . Richard and Hilary. The clothing shows the variable nature of the weather today . . . warm sunshine but with the occasional cool breeze. 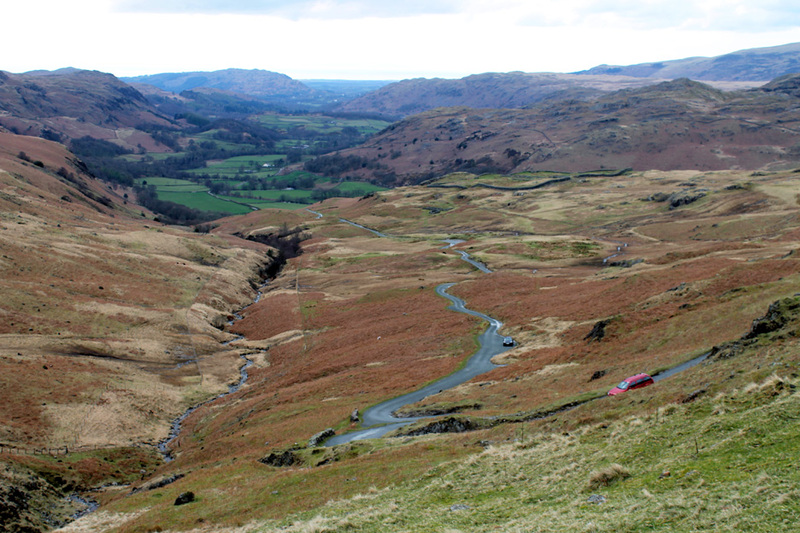 Looking east along the Wrynose Valley to the Kentmere fells the other side of Wrynose Pass. 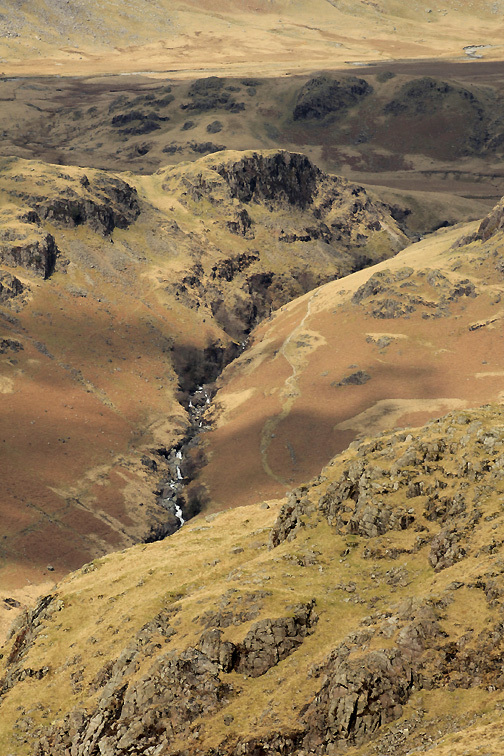 Closer at hand are Cold Fell on the left and Great Carrs on the right. ( Parking for three or four up here in this pull off just beyond the summit). Harry and Dylan have definitely decided it is a warm day. 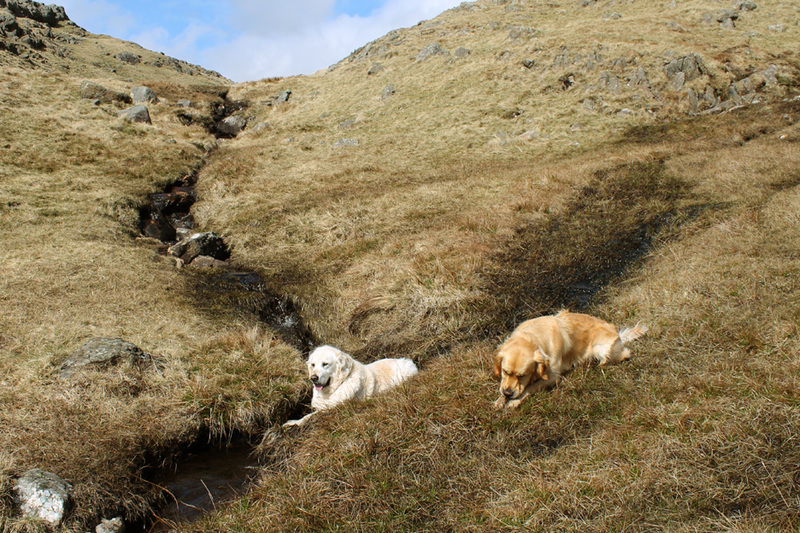 Harry sits fair and square in the mountain stream part way up the first short climb. 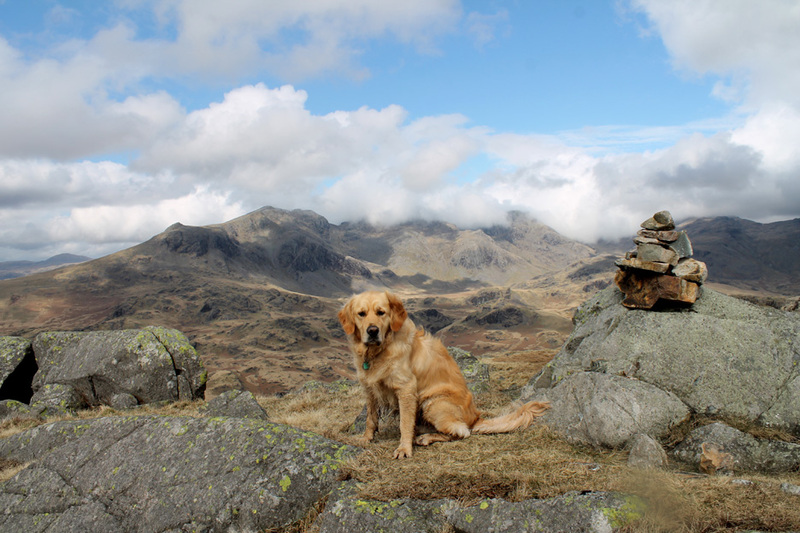 The top of Hard knott is quite undulating but the views from any of the summits are superb today. Why wait till you get to the actual summit ? Here's the view from our first piece of high ground between Border End on one side and the true summit on the other. Dylan . 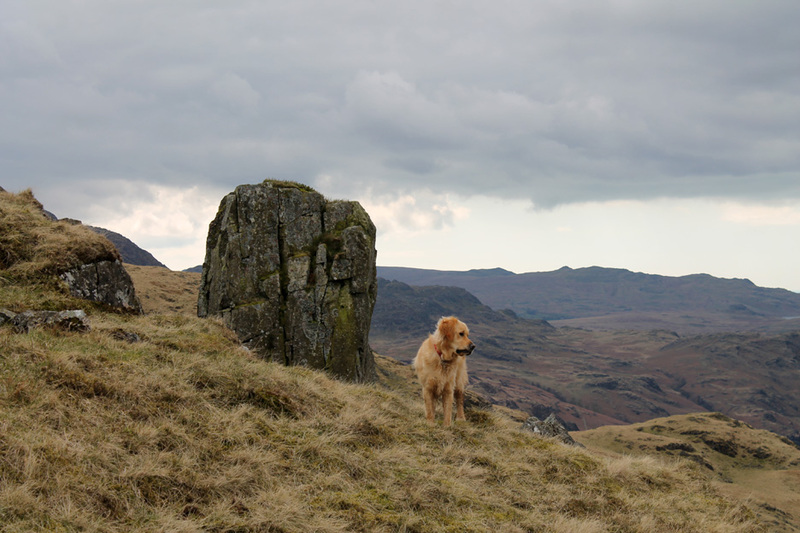 . . first as ever to the main cairn on Hardknott Fell. 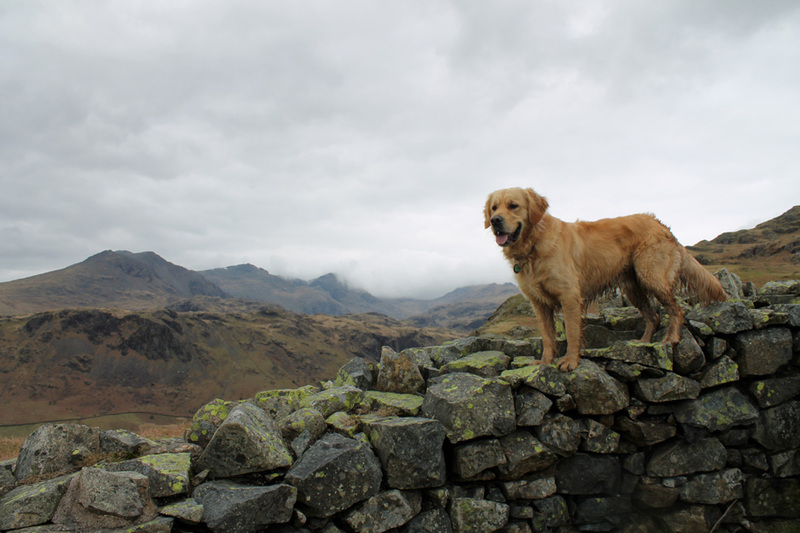 Behind him is the sweep of the Scafells . . . from Slightside round to Esk Pike. Group photo using the self-timer and a pebble or two to level the camera. 'Twas breezy on top . 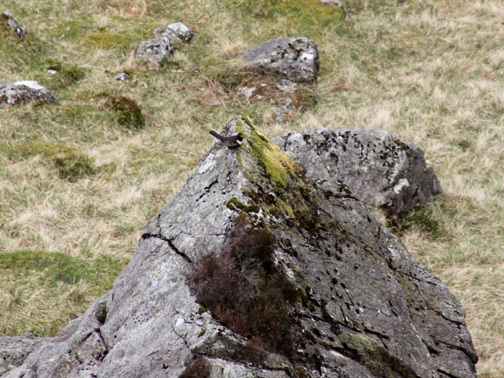 . . so we dropped down the western side of the fell until we found a sheltered spot for lunch. The view over lunchtime was of the high fells and passing clouds . 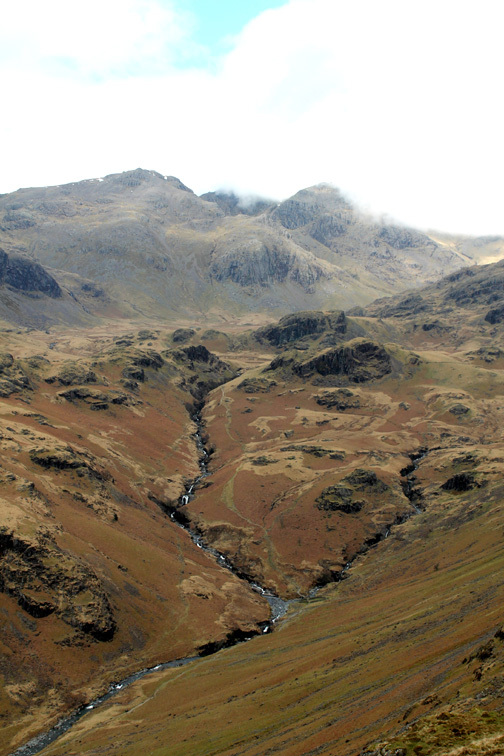 . . Scafell Pike being the one centre left. 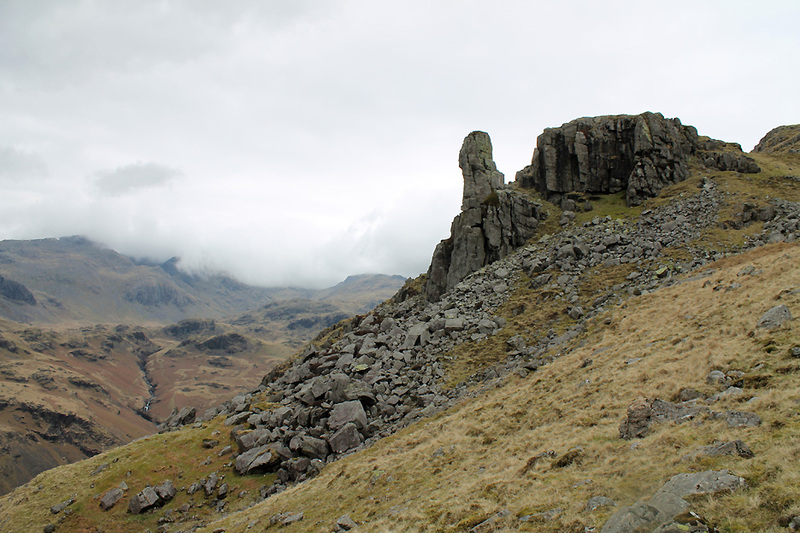 To the extreme left is Sampson's Stones and Cam Spout Crags plus the start of the route up to Mickledore. 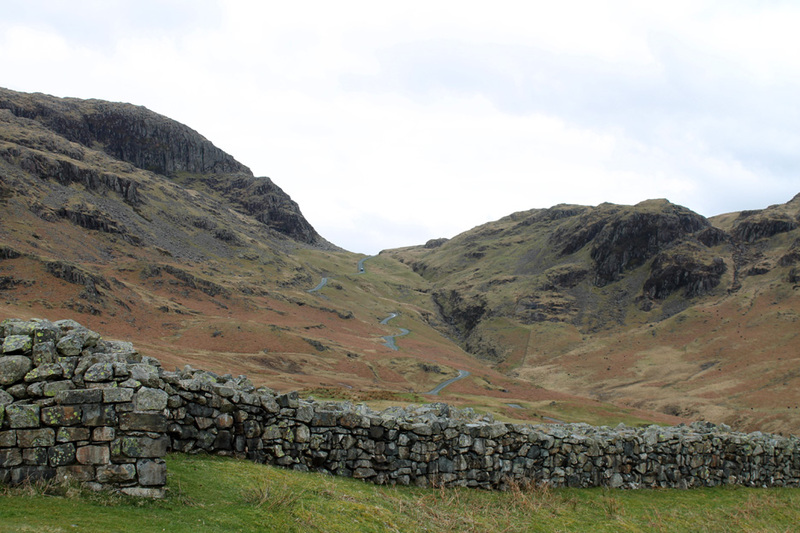 To the right is Little Narrow Cove and the scramble route up to Broad Crag and the pointed Ill Crag summit. Sunshine on the Upper Esk river and the falls above Lingcove Bridge. 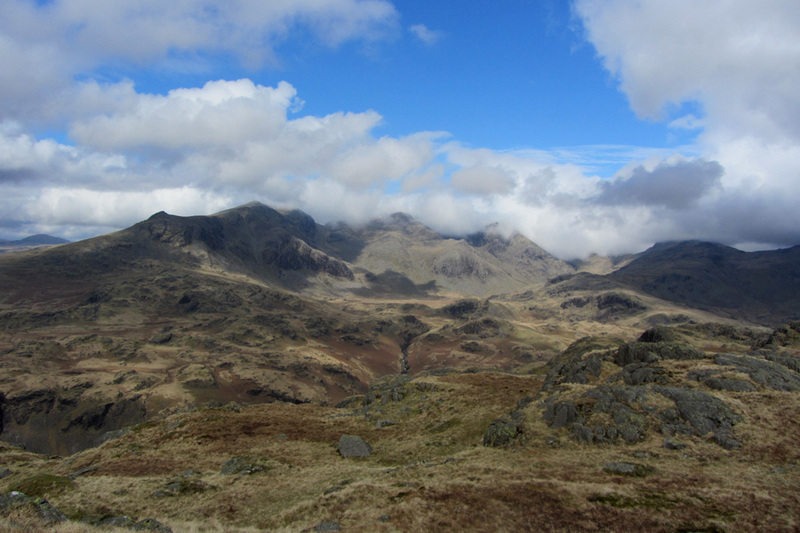 The wider (taller) picture to include the Scafells. As lunch progresses so did the weather . . . unfortunately the cloud was gathering and the sunshine was becoming more intermittent. 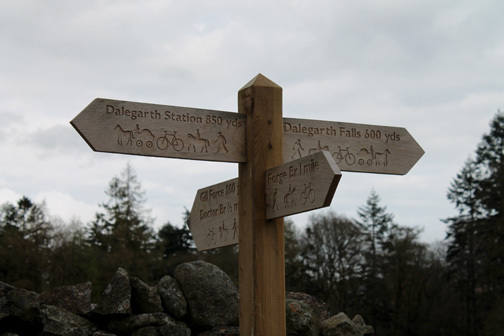 Our onward route took us across the western side of the fell as we would like to find the Eskdale Needle if we could. 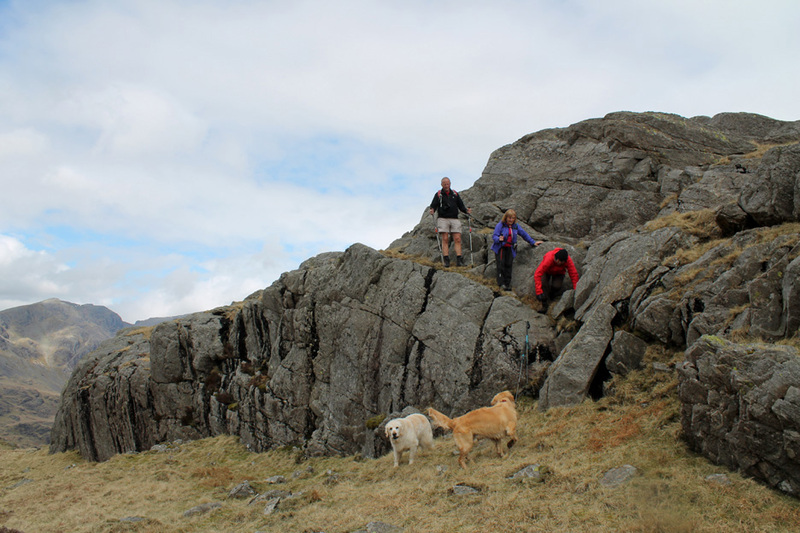 All the steep drops and scrambles can be avoided . . . unless you want to have a go of course ! 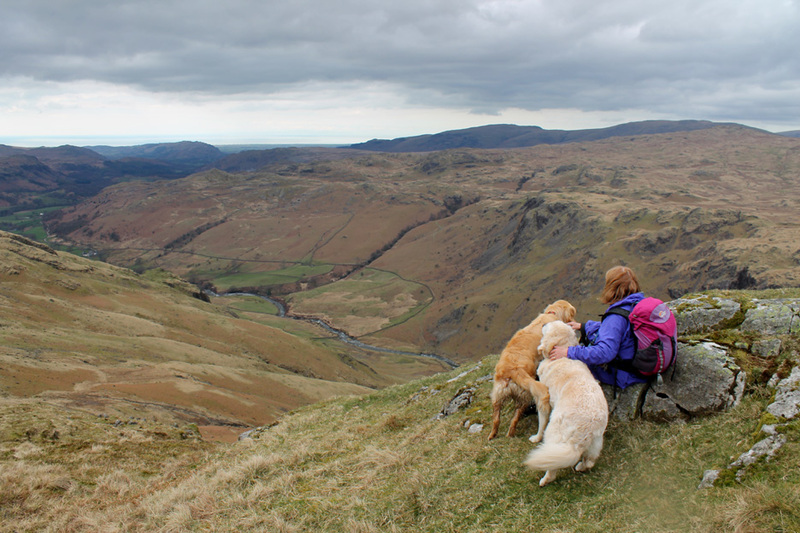 Ann and the dogs looking down on the lower Eskdale Valley. Below is there was a significantly loud double bird song that caught our attention . 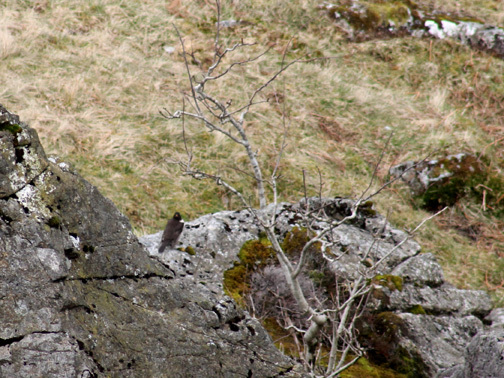 . .
On the rock below a 'blackbird' sized bird, with a black coat too . 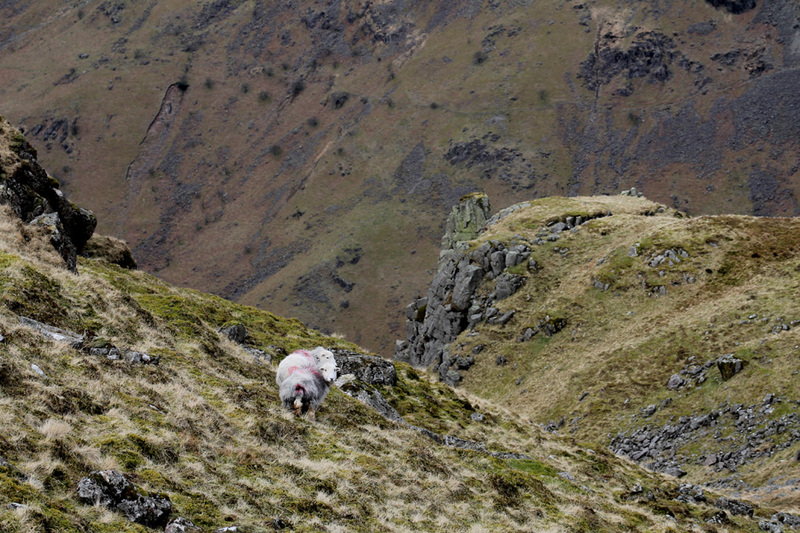 . .
Down below two Herdwick sheep . 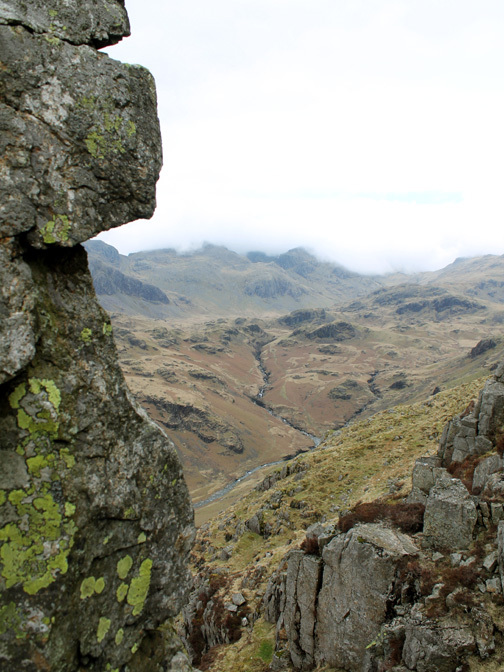 . . and perhaps the slightly illusive Eskdale Needle . . . pretending to be just another rock outcrop. |No more than a few feet high . . . by comparison to Dylan . . . But when you get up close and personal it is much larger . 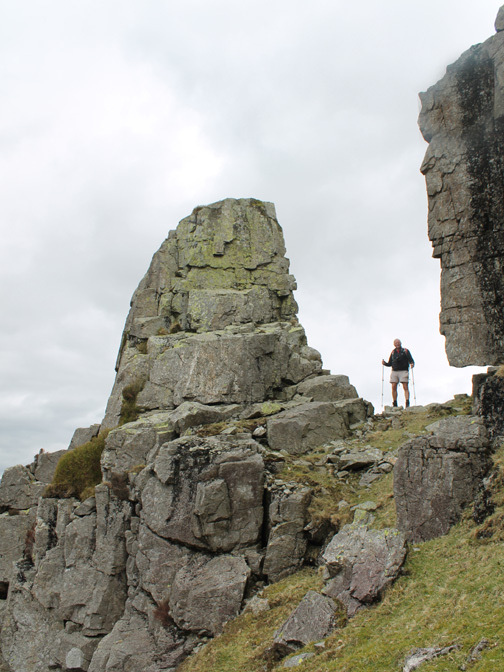 . . a thirty foot pinnacle standing out from the side of the fell. Here it is to true scale. 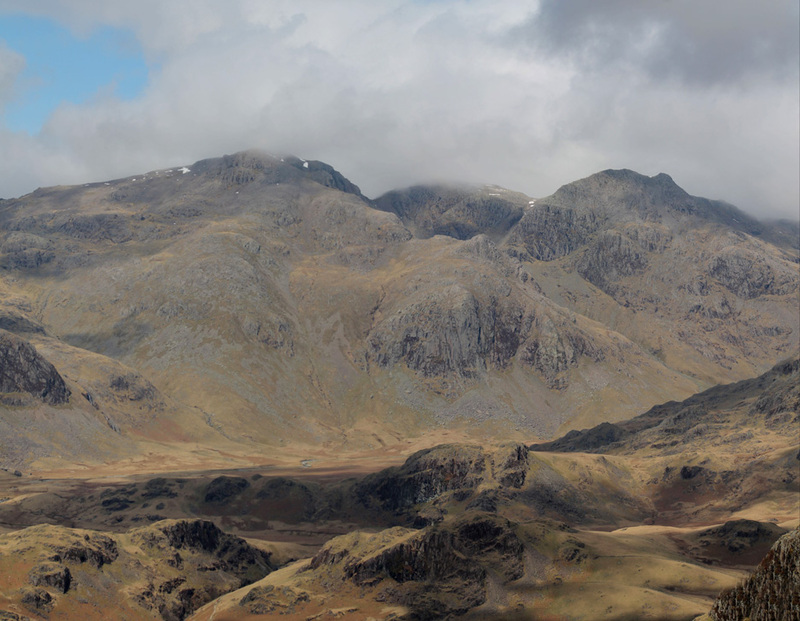 The view north to the cloudy Scafells. 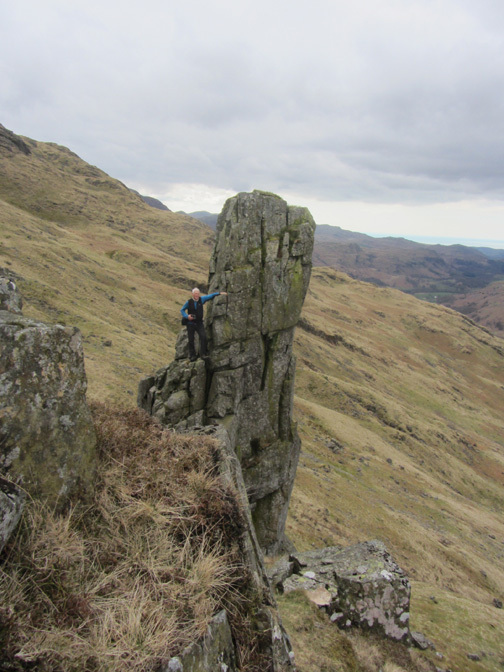 Richard threading the Eskdale Needle. cast down by some earthquake or by heavy winter frost loosening the rock and gravity doing the rest. We take a route almost due south west as it turns out. In practice we just worked our way down the side of the fell side, under Border End, heading for Mediobogdvm. Conveniently . . . there it was ahead . . . Mediobogdvm, the Roman Fort. On the end of this spur you can see the greener grass enclosed by the walls, with the north gate inviting us in to explore. In close up and from a little further down. 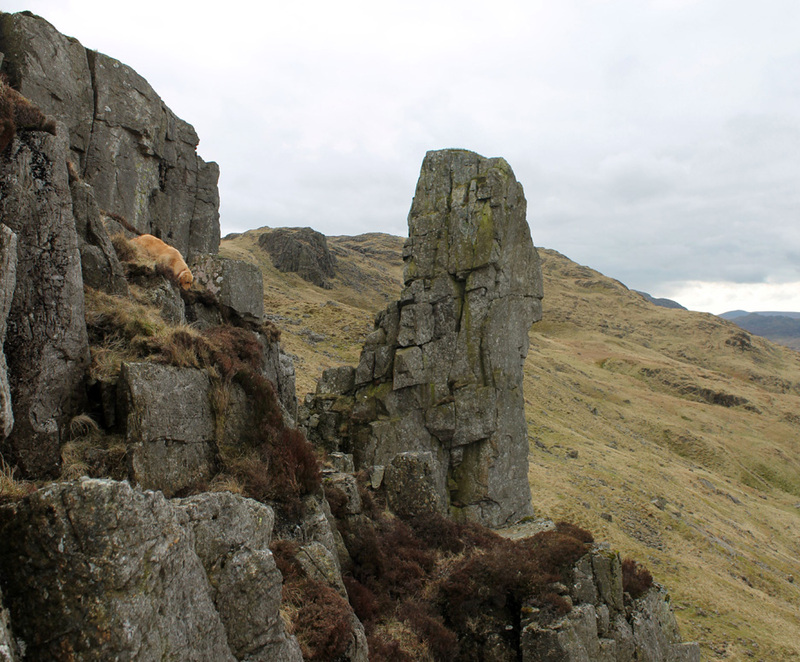 was the pile of stones this side of the low crag. which seemed to be an artificial mound with a hollow in the centre of the top. perhaps the site of a hill fort or oversized cairn marking a burial site perhaps . . . no mention in the local literature or on the maps. Ann took a direct route down to that north gate. 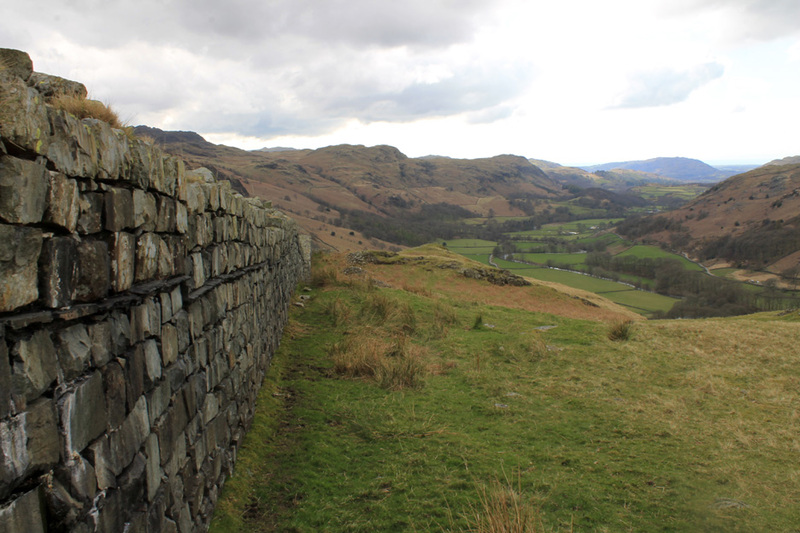 The recent history of the impressive Roman walls. 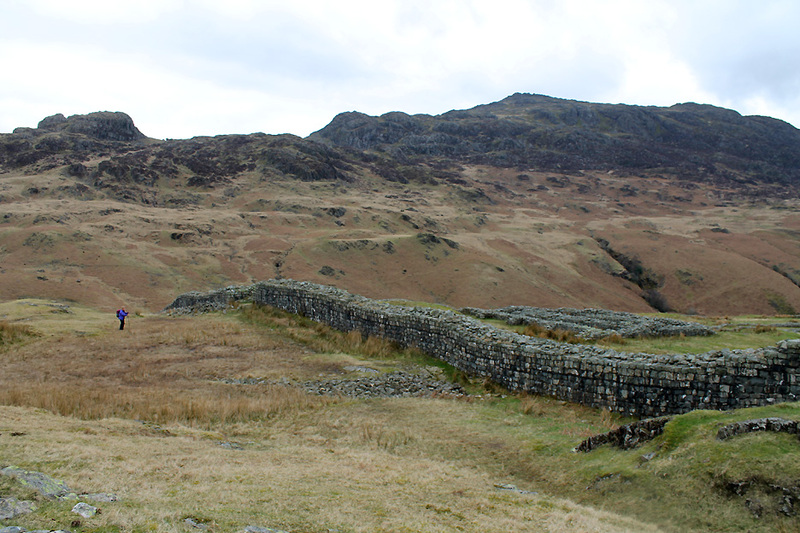 so this fort remains more intact than some other Roman fort sites. A young sentinel patrols the walls. 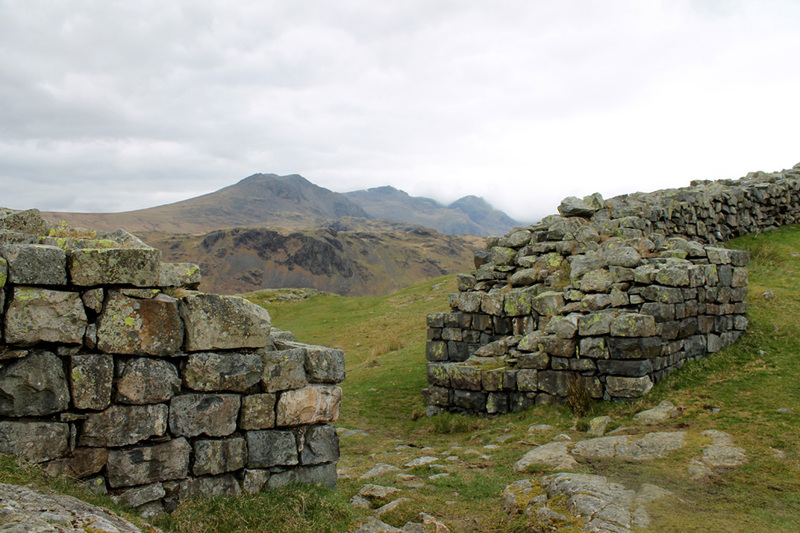 The west gate with the classic view of the high fells . . . slightly muted by the cloud and overcast nature of the day. A wider shot taken from the top corner tower position . 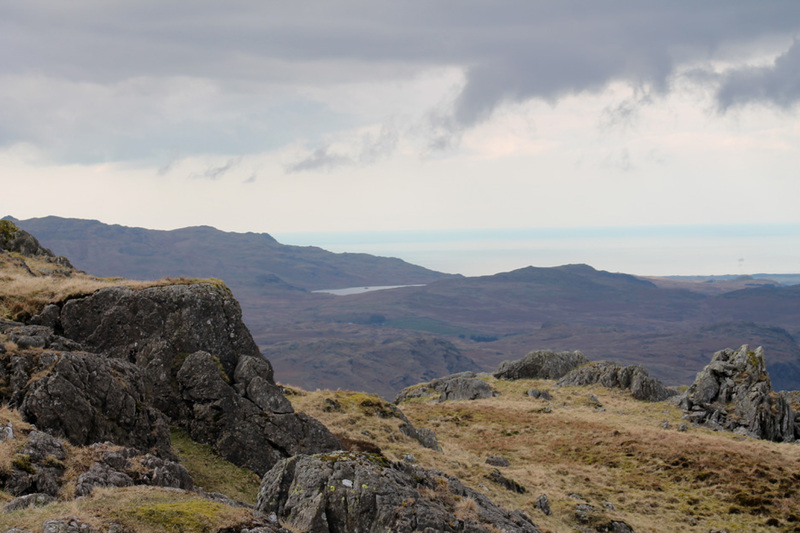 . . looking across to Harter Fell. 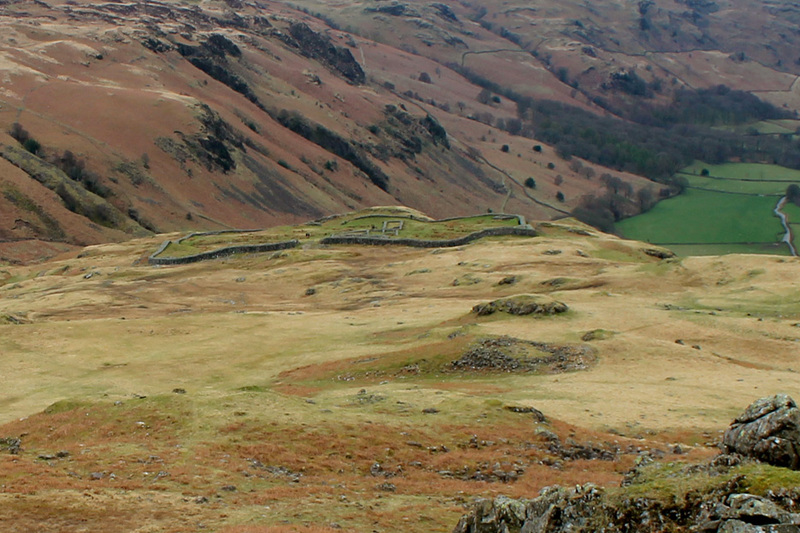 The fort certainly commanded a good strategic position at the foot of Hard Knott Pass. 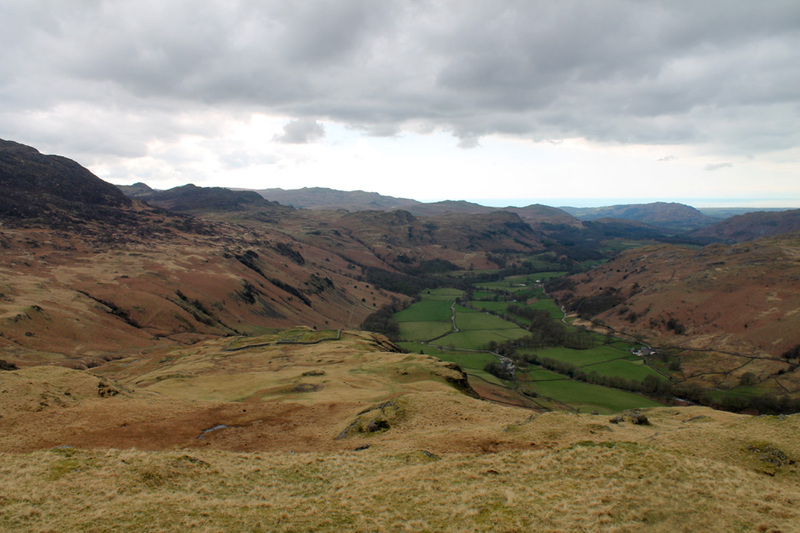 The Esk Valley provided an important trading and defensive route through the fells from Ravenglass on the coast to the Roman fort at Ambleside. These consisted of the Granary (food store) and the Commandant's residence. The Roman soldiers would have lived in wooded buildings that have not survived the passage of time. Harry taking time out in front of the Commandant's House. Has it been that hard a day ? 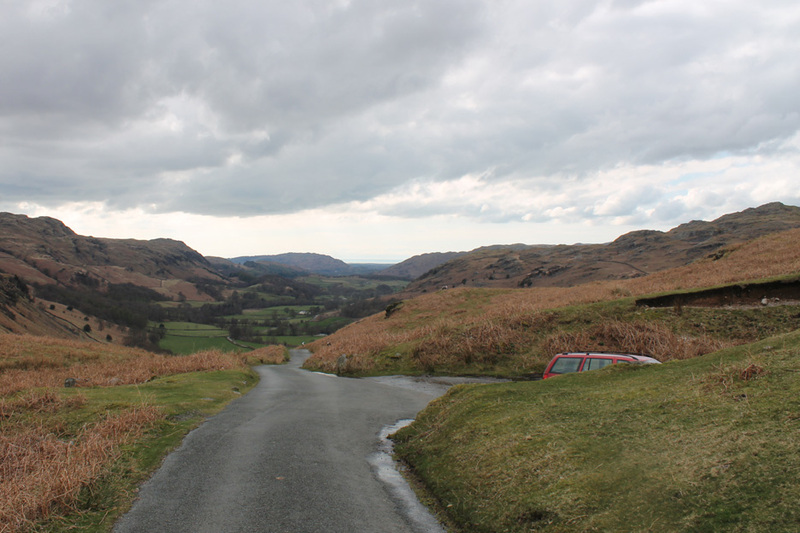 which zig-zags up the steepest road climb in the Lakes. and would end it down here at the second car. 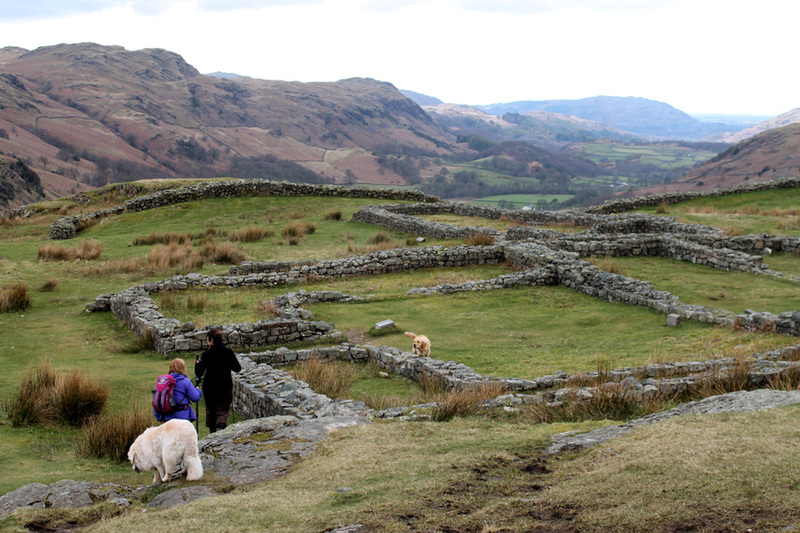 One last piece in the jigsaw is the external Roman bath house, sited between the fort and the road. The building would have housed a sauna and three different temperature rooms with under-floor heating and a wood fire at the far end. 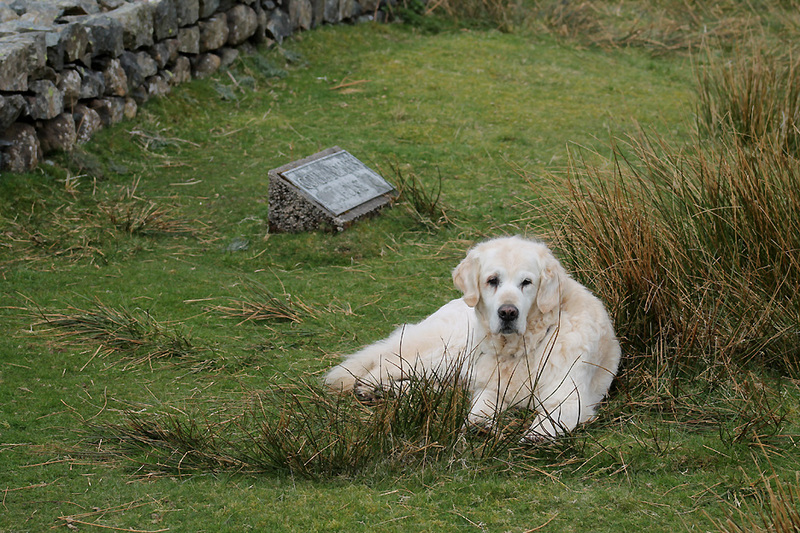 patiently waiting at one of the off road areas down below the main fort parking. This was a great three hour walk (plus lunch) and all the easier for walking downhill most of the way. and often there are no real paths at all. Find your own way on this one. to show Richard and Hilary another local beauty spot. This site best viewed with . 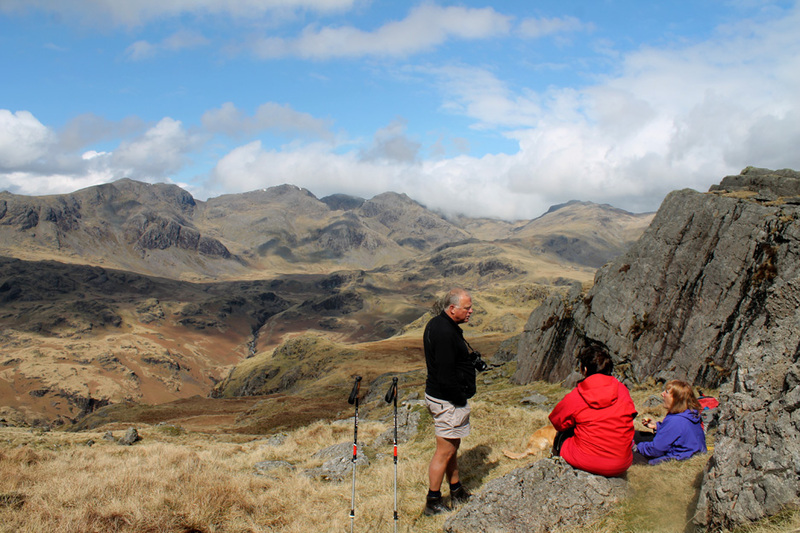 . . lunch in the sunshine overlooking the high fells.